Meanwhile, catch us live this month outside the capital! Sillä välin, yhytä jokin tämän kuun keikoista pääkaupungin ulkopuolella! Contest for the Katse show on Saturday! Comments Off on Contest for the Katse show on Saturday! CONTEST! Share the event (link below) of next Saturday’s Shiraz Lane and Burntfield show at Katse on facebook, and you might be the lucky one to get yourself Shiraz Lane’s Be The Slave or Be The Change and Burntfield’s Organic Waves -EP:s! The CD:s will be delivered at the venue before the show. After you’ve shared the event, remember to comment on the post so that the information won’t be missed. SKABA! Jaa Shiraz Lanen ja Burntfieldin ensi lauantaisen Katseen keikan tapahtuma (linkki alla) facebookissa, ja olet mukana arvonnassa jonka voittajalle menee Shiraz Lanen Be The Slave or Be The Change ja Burntfieldin Organic Waves -EP:t! Levyt luovutetaan paikan päällä ennen keikkaa. Jaettuasi tapahtuman, muista kommentoida postaukseen niin tieto ei mene sivu suun. 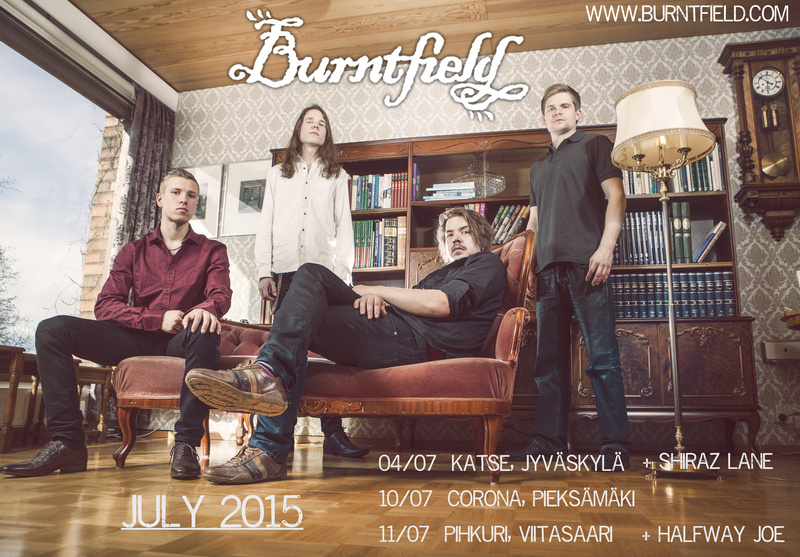 New date in Turku for August, shows in July…! Comments Off on New date in Turku for August, shows in July…! After the release of our new EP Cold Heat and the EP-release show at Semifinal on 5 August, the summer is not over yet when Burntfield will play a semi-acoustic show in the intimate atmosphere of Sointu, Turku on 21/08! Showtime 22:00, free entry.